Javier Torres Maldonado (Mexico, 1968) is a composer and teacher who combines both functions in a very high-profile career. He has received an international array of honours including the "Commande d'État" by the French Ministry of Culture (2007, 2009, 2011 and 2013), the prizes "Da Capo" (Brandenburger Biennale, 2012, Germany), GRAME (Lyon, 2006), as well as different prizes at competitions "Queen Elisabeth" (2004, Brussels), "Alfredo Casella" (2001, Siena), Queen "Maria Jose" (Geneva, 2000), "Mozart" (Mozarteum in Salzburg, 1999 and 2001), "Ad Referendum II" (1997, Montreal), “Prix des Musiciens" (Nouvel Ensemble Moderne, 1998) "Ibermusicas-Iberescena" (2013), among others. 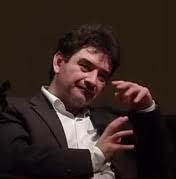 He was the composer nominated to the “Catedra Manuel de Falla” (Spain, 2015) and in 2016 he has been nominated as composer in residence at the National Center of the Arts in Mexico City (project: new work for the Arditti Quartet and Jake Arditti -countertenor-, commissioned by Irvine Arditti with funds of Ibermusicas). Torres Maldonado has created different works as composer in residence, collaborating with important European institutes for acoustics and music research as GRAME (Lyon), La muse en circuit (Paris), CIRM (Nice), SCRIME (University of Bordeaux), among others. His works are published by Suvini Zerboni (Milan) and Universal Edition (Vienna). Author of most than fifty works composed for internationally renowned performers as Mario Caroli, Pablo Márquez, Arditti Quartet, Ensemble 2e2m, Carlo Chiarappa, Ensemble Orchestral Contemporain, Ensemble Sillages, Laboratorium Ensemble, Nouvel Ensemble Moderne, Choeur Britten, Sigma Project Quartet, Ensemble Accroche Note, Divertimento Ensemble, Ensemble "El Perro Andaluz" of Dresden, Ensemble Tema of Karlsruhe, Ensemble Aleph, Ensemble “Taller Sonoro” (Spain). Most of his works have been commissioned by prestigious institutions and performed widely at renowned international music festivals like Wittener Täge für Neue Musik (WDR 3), Biennale of Venice, Klangspuren (Austria), Mozart Week (Salzburg), Tiroler Festspiele Erl, Musica (Strasbourg), Présences (Paris), Musiques en Scène (Lyon), Quincena Musical (San Sebastian), Ciclo BBVA (Bilbao), Lucerne Festival, Warsaw Autumn (Polony), Akiyoshidai (Japan), amongst other. He is Tenure Professor of electroacoustic composition at the Conservatory of Parma, Italy. The composition projects he will develop between 2017 and 2018 include a new work for the Ensemble Klangforum of Vienna (commissioned by the Ernst von Siemens Foundation, Germany, for the Festival Internacional Cervantino of Mexico) and an electronic piece for 60th anniversary of the Mozarteum’s Electronic Music Studio commissioned by this institution that will be premiered in October 2018.